The two CSC Albertan Chapters are holding a joint meeting in Red Deer on Tuesday, April 12. The Calgary and Edmonton contingents will meet each other halfway for a site tour, dinner, and presentation related to integrated project delivery (IPD). 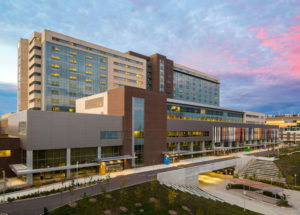 Toronto’s Humber River Hospital has achieved Gold under the Leadership in Energy and Environmental Design (LEED) program, surpassing its target of Silver. Humber River Hospital shot for Silver, but instead earned Gold. The Toronto acute care hospital exceeded its high sustainability goals and was certified to the higher level under the Leadership in Energy and Environmental Design (LEED) program. With an impressive safety record (no lost-time injuries in 5 million hours worked), the project was completed on time and on budget. “Surpassing the project’s intended LEED Silver classification to achieve LEED Gold is a testament to the entire collaborative team’s relentless pursuit of achieving unprecedented energy efficiency targets to reduce Humber River Hospital’s carbon footprint and create a facility that balances energy efficiency and innovative technology, enabling the hospital to focus on its core business of providing exemplary patient care,” said Bruce Macpherson, project director with PCL Constructors Canada, the project’s design-builder and construction manager. This project team included experts in a variety of fields. Consulting was provided by MMM Group Limited (sustainability), Smith + Andersen (mechanical/electrical), and WSP Canada/Halsall (structural), with Modern Niagara Toronto and Plan Electric as the mechanical and electrical contractors, respectively. The project’s civil engineer was A.M. Candaras Associates, while HDR Architecture Associates served as its architect and Quinn Design Associates filled the role of landscape architect. Initially targeting 15 points under LEED Canada for New Construction and Major Renovations (NC) 2009 Credit Energy and Atmosphere (EA) 1: Optimize Energy Performance, the project broke new ground for Canadian acute care hospitals by achieving 17. This exceeds the standards set under American Society of Heating, Refrigerating, and Air-conditioning Engineers (ASHRAE) 90.1-2007, Energy Standard for Buildings Except Low-rise Residential Buildings, by 40.1 per cent. The building itself is also very well-insulated, and its thermal control is further supported by window design, which implements dynamic glass that is adaptable according to weather and patient preference. Further, the facility reduces other kinds of energy and waste—for instance, a rainwater-capture system allows it to reduce water use by 33 per cent. Recycled content comprises 20 per cent of the materials used in its construction, and 96 per cent of the waste that was generated was not sent to landfill. These technologies also helped streamline the construction schedule, allowing it to be completed in 43.5 months. Modular construction of 360 patient washrooms and telecommunications rooms also facilitated this. For more on this aspect of the project, see the video below.